Belgian Malinois Characteristics: The diligent and watchful Belgian Malinois is a breed of Medium to Large dog classified as a member of the Herding Dog Group (AKC:1959). The Belgian Malinois, is characterized by its well proportioned, sturdy appearance with a long, clearly defined head and proud expression. Other characteristics include medium sized, almond-shaped dark eyes; erect triangular shaped ears; a broad, straight back, deep chest and a brisk gait. The temperament of the Belgian Malinois can be described as Hard-working, Friendly, Protective. The coat type of the Belgian Malinois is described as short, straight, weather-proof coat in assorted colors. Due to its characteristics and qualities, the Belgian Malinois demonstrated the desired traits of a Watch dog and Farm Dog and is known by its nick name the "Belgian Sheepdog". The origin of the Belgian Malinois dog breed was in Belgium where it was developed in the 1800's. Belgian Malinois Breed Group and Dog Type - Herding Dog Group (AKC:1959): The Belgian Malinois is one of the many breeds of dogs that belong to the Herding Dog Group (AKC:1959). Other names for the Belgian Malinois: The Belgian Malinois is known by the nickname of the "Belgian Sheepdog". Other names for this breed of dog include the Mechelse Herder and the Chien de Berger Belge. N.B.The word 'Berger' is an occupational name for a shepherd. Names of the Belgium Sheepdogs: The names of the four different types of Belgian Sheepdogs are; the Groenendael (Belgian Shepherd), the Laekenois, the Tervueren and of course the Malinois, who are all named according to their Belgian region of origin. Origin of the name: The origin of the name "Belgian Malinois" derives from the city of Malines (the French name for Mechelen ) in the province of Antwerp, Flanders, Belgium. Belgian Malinois History and Origin: The country of origin of the Belgian Malinois breed was in Belgium during the 1800's. The country of origin of the Belgian Malinois breed was in Belgium during the 1800's. Ancient sheepdogs were believed to be descended from the Gray wolf and the Peat Dog, and have guarded and herded flocks of sheep in nearly every land in Asia and Europe. 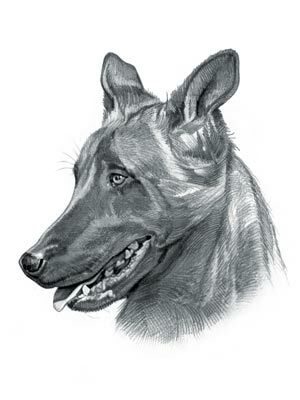 A descendent of these ancient sheepdogs was the Belgian Malinois. The ancestors of the Belgian Malinois not only looked after sheep but also acted as guard dogs and protected flocks from dangerous predators such as bears and wolves. In the brutal winter of 1242 wolves were driven out of their dens and came as near as the gates of Ghent to try to get food. The Belgian Malinois was used as a hunting dog, and wore a spiked collar with points called 'gorgerins' which wounded the wolf in any fights. The last wolves vanished from Belgium in 1847 and the sole activities of the Belgian Malinois related to that of a sheepdog. The role of the Belgian Malinois was separated into two types of activities - the runner and the checker. The 'runner' herded the sheep, keeping the flock within permitted borders. The checker acted as a guard dog, working close to the shepherd, and responded to signals and commands to round up a straying sheep. During the 19th century the Belgian Malinois, and the other Belgian sheepdogs went into a decline due to the Industrialization of Belgium with the modernization of agriculture and the reduction in the numbers of sheep due to the increased importation of wool at cheap prices. Belgian Malinois History: The future of the Belgian sheepdogs became uncertain and the different types of sheepdogs in Belgium were not even distinguished from each other. The problem was addressed in 1891 when Professor Adolphe Reul of the Veterinary Institute in Cureghem, located near Brussels, took an interest in the Belgian sheepdogs. Professor Reul arranged for a meeting of dog owners, shepherds and herdsman at Cureghem. The owners brought their dogs with them and Professor Reul was able to examine nearly 100 sheepdogs. Professor Reul recommended the dog owners to establish selective breeding programs for dogs of the same coat type, regardless of their hair colors. On September 29, 1891, the Club du Chien de Berger Beige (Belgian Shepherd Dog Club) was founded and on May 8, 1892 the first Belgian specialty dog show was held in Cureghem, Belgium. The different types of the Belgian sheepdogs were named, more or less, for the towns in which they originated. The Belgian Malinois was named after the city of Malines, now known as Mechelen. The Belgian Malinois breed was exported across Europe and in 1911 the first two Belgian Malinois dogs were imported into the United States. Following WW2 (1939 - 1945) rose in populaity and this trend has continued to the present day. The Belgian Malinois was officially recognized by the American Kennel Club (AKC) in 1959 and the American Belgian Malinois Club was founded in 1978. Belgian Malinois Modern History: The modern history of the versatile Belgian Malinois dog moved on and the breed is now used as a Watchdog, Guard Dog, Farm worker, search-and-rescue dog, family companion and as a military and police dog. Belgian Malinois Height: The Belgian Malinois breed is classified as a Medium to Large sized dog. The height to the shoulder of a male dog is 61-66 cm (24-26 in). The height to the shoulder of a female Malinois dog is 56-61 cm (22-24 in). Belgian Malinois Weight: In this medium to large sized dog, the weight of a male Malinois dog is 25-30 kg (55-66 lb). The weight of the smaller female dog is 20-25 kg (44-55 lb). Belgian Malinois Coat Type: The Malinois coat type is described as a short, straight, weather-proof coat. Belgian Malinois Coat Colors: The colors of the Belgian Malinois dog breed consist of assorted colors consisting of mahogany, fawn, tan and has a black mask. Belgian Malinois Grooming - LOW Grooming Needs: The dog grooming needs of the Belgian Malinois are categorized as Low in order to maintain a healthy coat and reduce the risk of skin infections. The limited dog grooming needs of the Belgian Malinois are therefore considered to be low maintenance, requiring limited attention to grooming with casual brushing and combing. Dog Grooming needs should also include bathing your Belgian Malinois on a monthly basis and making regular inspections of the eyes, ears, nails and teeth. Belgian Malinois Litter Size: The litter size of the Malinois dog breed ranges from 6-10 puppies. Belgian Malinois puppies for sale can be obtained reputable breeders and from rescue centers. The cost of Belgian Malinois puppies varies depending on location, pedigree history and the dog breeder. Belgian Malinois Temperament and personality: The temperament and personality of this popular dog breed is described as Diligent, Hard-working, Friendly, Protective and Watchful. Belgian Malinois Exercise Requirements - MODERATE Exercise Requirements: The exercise requirements of this breed of dog are moderate. The Belgian Malinois requires regular daily exercise consisting of about one hour every day. This medium sized dog has a strong, supple brisk gait with strides of a moderate length requiring a steady walking or jogging speed by the owner to meet the dogs exercise requirements. If the dog has more energy than you do, then teach your dog to play ball in a chase and catch game. Belgian Malinois Diet: A fully grown Belgian Malinois should be fed twice a day. A diet consisting of a premium dog food can be balanced with fresh food eaten by the family. The question is What Can Dogs Eat?. Check out our comprehensive list of what dogs can and what dogs cannot eat. Belgian Malinois Health Problems: Potential health problems of the Belgian Malinois breed include Eye problems, Epilepsy, Hip Dysplasia . Resolving health problems can prove to be expensive and it is always wise to obtain pet insurance or dog health insurance when buying a dog. Is the Belgian Malinois dog breed said to be Hypoallergenic? Answer: No. Belgian Malinois Lifespan: The life expectancy of dogs vary according to the size, breed of dog and any serious health problems. The typical lifespan of the Belgian Malinois breed is 12-14 years. Belgian Malinois Male Dog Names: Male Dog names are most often chosen to reflect favorite names of the owner or the strength, size, coloring and country of origin of the Belgian Malinois breed. To give you some inspiration regarding good male Belgian Malinois names our small selection might be of help with naming boy dogs. Our top male dog names are: Beaufort *** Beauregard *** Drakkar *** Dred *** Burel *** Gaspard *** Gerrard *** Jinx *** Payne *** Ragnor. Belgian Malinois Female Dog Names: Female Dog names tend to be softer, prettier and reflect the temperament of the Malinois girl dog. Our top choice of good female Belgian Malinois names are Cherise *** Mystique *** Nanon *** Collette *** Reba *** Zia *** Deziree *** Suzette *** Candy *** Dinah *** Hannah.